This post is by Sally Kuzemchak, MS, RD, a registered dietitian, educator, and mom of two who blogs at Real Mom Nutrition. She is the author of The Snacktivist’s Handbook: How to Change the Junk Food Snack Culture at School, in Sports, and at Camp—and Raise Healthier Snackers at Home. She also collaborated with Cooking Light on Dinnertime Survival Guide, a cookbook for busy families. You can follow her on Facebook, Twitter, Pinterest, and Instagram. Whether your child attends a half-day or full-day preschool program, there’s probably a snack involved. Preschool snacks are designed to encourage community in the class, teach table manners and sharing, and even build gross and fine motor skills as kids help pour drinks and serve food. 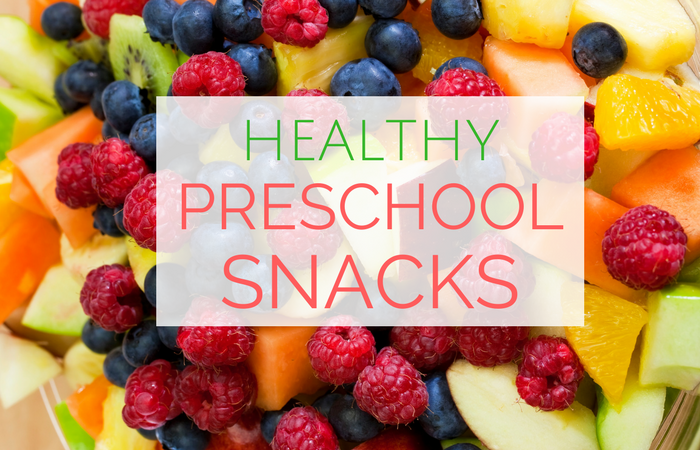 Snacks also help keep children nourished between meals, especially during full-day preschool. Unhappy with the Snacks at Preschool? I hear from many parents who say they’re unhappy with the snacks served at their child’s preschool—foods like cookies, vanilla pudding, and gummy fruit snacks that they wouldn’t serve at home. Many of these foods contain added sugar and ingredients like synthetic foods dyes that many parents avoid. Some preschools also serve juice, which is a growing concern among health experts, who say kids get too many calories and too much sugar from juice. If you’re not pleased with the snacks your child gets at preschool, I urge you to talk to your child’s teacher or the preschool director. Be polite about expressing your concerns and ask if there’s a way you can work together. It’s always helpful to come with ideas and a willingness to help. If the preschool provides snacks, there may be budget and time constraints that could make something like sliced fresh fruit impossible—but unsweetened applesauce cups could work instead. If parents take turns providing snacks, the teacher might be on board with sending out a list of healthy suggestions. Pinwheel sandwich wraps: Place a slice of deli meat and cheese on a whole grain tortilla, roll up, and slice. Ants on a Log: Stuff spreadable cheese or sunflower butter inside celery sticks and dot with raisins or dried cranberries. Green Smoothies: Blend spinach, bananas, pineapple, and water. Fruit salad: Fill ice cream cones or paper cups with a mix of berries and cut fruit. Bananas: Write each kids’ name on it with a marker for fun. *Always check with your child’s preschool concerning their policy on nuts, tree nuts, and other allergens before bringing any food. If you’re unhappy with the snacks your child gets in other places—like on sports sidelines and at summer camp—check out my e-book The Snacktivist’s Handbook, the ultimate toolkit for any parent wanting to make a change to the typical junk food snack culture in youth sports, at school, at camp, and even improve snacking at home. It’s available as a digital download or a full-color paperback and includes more than 75 pages of ideas, printables, emails to send to coaches, teachers, and camp directors, and a week’s worth of snack recipes. What has your experience been like with snacks at preschool? Tell us in the comments! Sally Kuzemchak, MS, RD, is a registered dietitian, educator, and mom of two who blogs at Real Mom Nutrition. She is the author of The Snacktivist’s Handbook: How to Change the Junk Food Snack Culture at School, in Sports, and at Camp—and Raise Healthier Snackers at Home.She also collaborated with Cooking Light on Dinnertime Survival Guide, a cookbook for busy families. You can follow her on Facebook, Twitter, Pinterest, and Instagram. In her spare time, she loads and unloads the dishwasher. Then loads it again. At my sons prek last year I packed his own snack and I liked that control. He’s in kindergarten now and I provide his snack but the teacher gives candy treats every day for good behavior and another for completing his reading log sheet. I wish he wasn’t getting daily candy! I also packed snack in Kindergarten and will do the same this year for first grade. I too am appalled with the amount of candy and surgary food passed out at school. I spoke with his teacher and explained that we do not do any candy and very limited sugar at our house. She was pretty responsive, but there were still times he was given donuts or cookies. When I worked in a preschool and my children went to the same preschool, they had the types of snacks you talked about as the preschool was regulated by the government. The snacks had to be healthy. We had people come in and make sure that we were following the rules and guidelines for running this preschool that were set out be the government department that supervised preschools and daycares. This list is great with the exception of the popcorn. Popcorn is actually on the American academy of pediatricians list of foods to avoid in small children due to high risk for choking. Popcorn is a wonderful snack, just maybe for older children. I was looking for a few healthy snack ideas and you do have some good suggestions. Mostly interested in low sugar snacks do you have a post about this? Hi there. Most of these are low sugar. Our school has a “MUST BE PACKAGED” rule about snacks. Nothing home made! It makes things super difficult. Any ideas to send my way about providing healthy but prepackaged snacks with full ingredient disclosure on the items? There are quite a few things on this list that you can find prepackaged. Fruit salad packed in juice or water, baby carrots, yogurts (be picky about brand for sugar amounts), cheese sticks, raisins, whole grain crackers and cheeses. I wonder why they have that rule… is it so they can protect the allergy kids by being able to check labels? Our preschool had a “prepare it here or packaged” rule so you could still do stuff like cantalope but you had to use their kitchen to cut it up. We did group snack though. That makes a difference too. It’s also very important that the cooking process of these foods should also be healthy like, use healthiest cooking oils , fruits, and other products included in cooking.